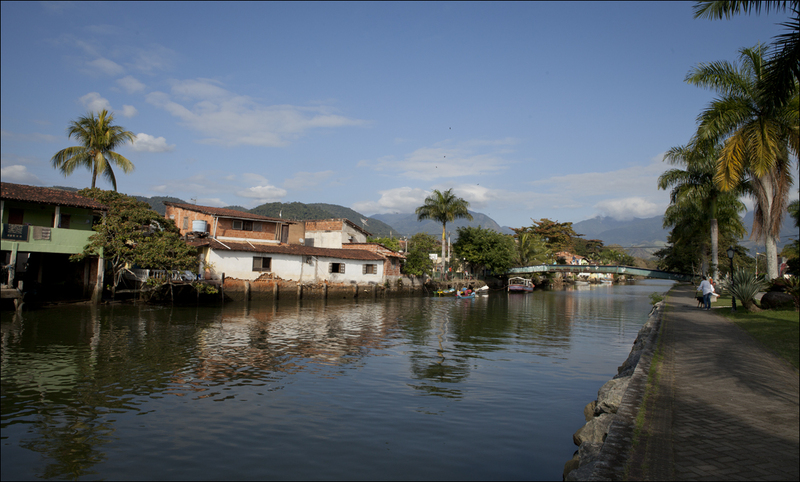 The second stop on our tour of Brazil was the little town of Paraty, where the USK symposium was held. 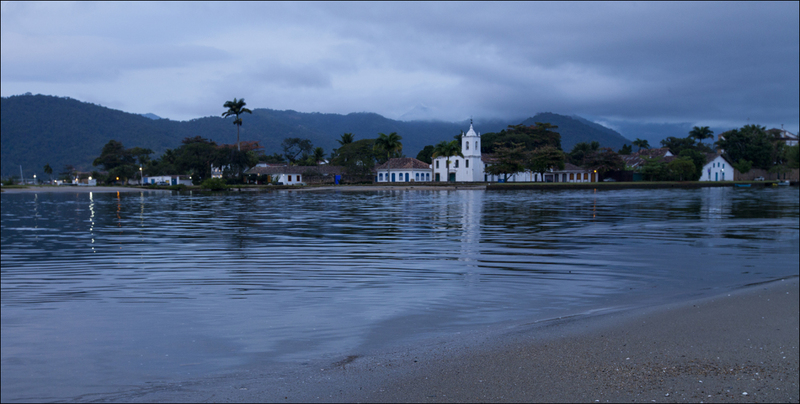 Paraty is a port dating back to colonial times. I hear it was the launching point for ships full of gold heading to Spain. Today there is continual boat traffic taking visitors up and down the coast on sightseeing cruises. The part of the town used by tourists can’t be much than ten square blocks. The whole thing has been restored with cute white plaster houses, clay tile roofs and cobblestone streets. There are three big churches for this tiny village, but otherwise it’s all gift shops, small galleries, restaurants and hotels. Beyond a series of chained off streets keeping out everyday traffic there is a normal Brazilian town with the businesses you’d expect in a tourist destination. Bike rentals, the boat tour operators, t-shirt shops and hostels. On the tourist side, everything is a kind of artificial quaintness. On the real world side, it’s a little more gritty. Normally I wouldn’t pick this town for a sketching location. You’re not going to see any ‘real life’ going on here. But for our purposes, it was an ideal setting. 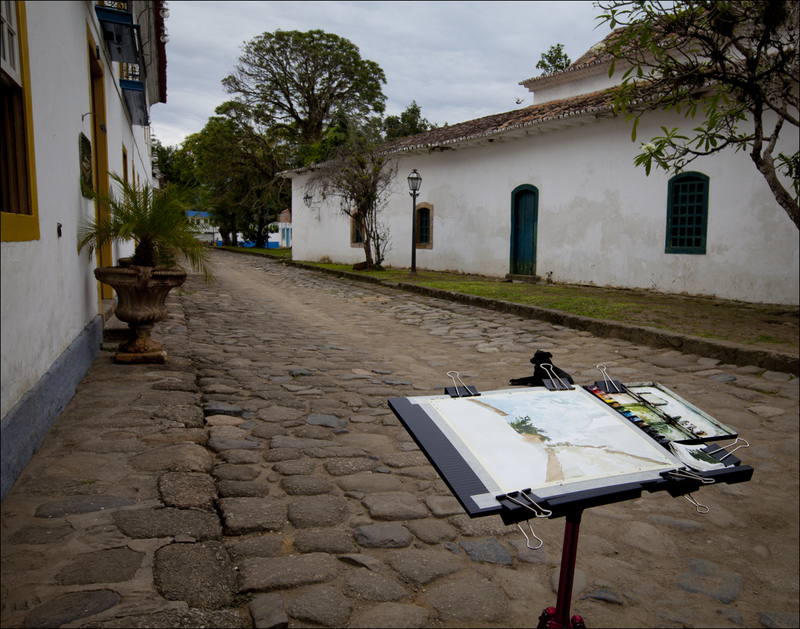 We were able to wander around at all hours, getting from spot to spot in minutes, essentially taking over the entire town for our private sketching party. Quite a different experience from last year’s symposium set against the hustle of Barcelona. This made it the most productive USK event I’ve been to – in terms of getting my own sketching done outside of my ‘work day’ teaching. Each morning of the workshop some of the keener painters would be up early. We had about a hour between breakfast and first classes to get a sketch in. 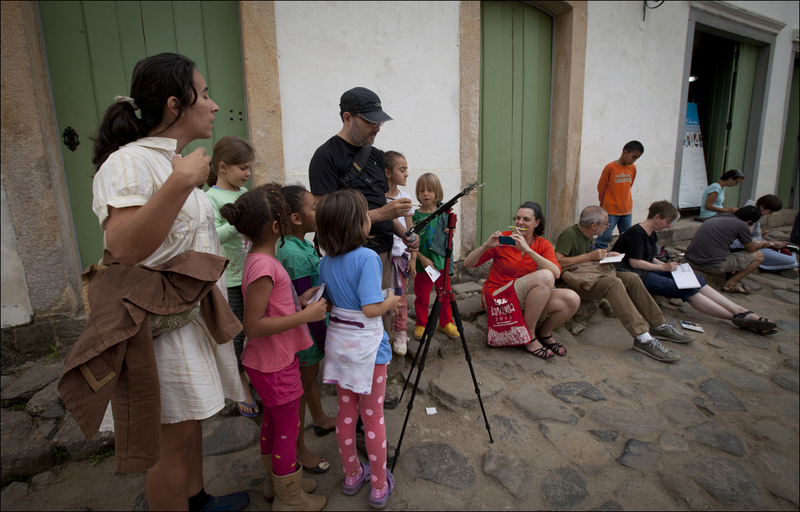 Some of the extraordinarily keen would get up before breakfast and paint, then stop back for those Brazilan cheesey puff ball things that the hotel puts out every morning. The first day many of the international instructors ended up sketching right outside the hotel, just sitting in the street and catching new people as they got up and out. 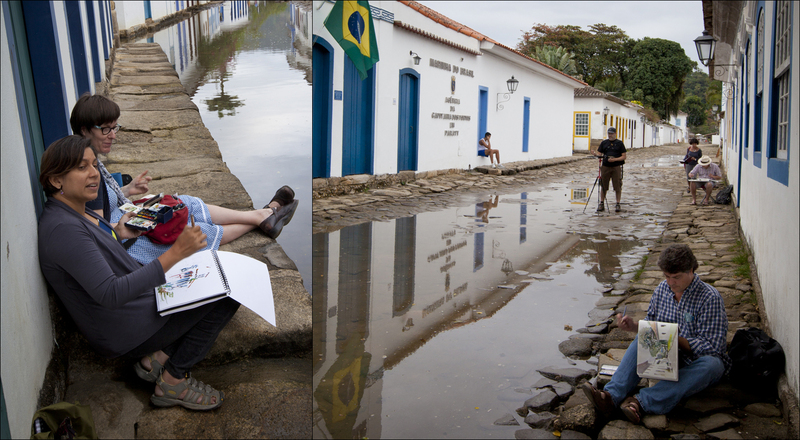 Eventually we had half of the symposium sitting in the street, getting right down to why we were there – obsessive sketching! 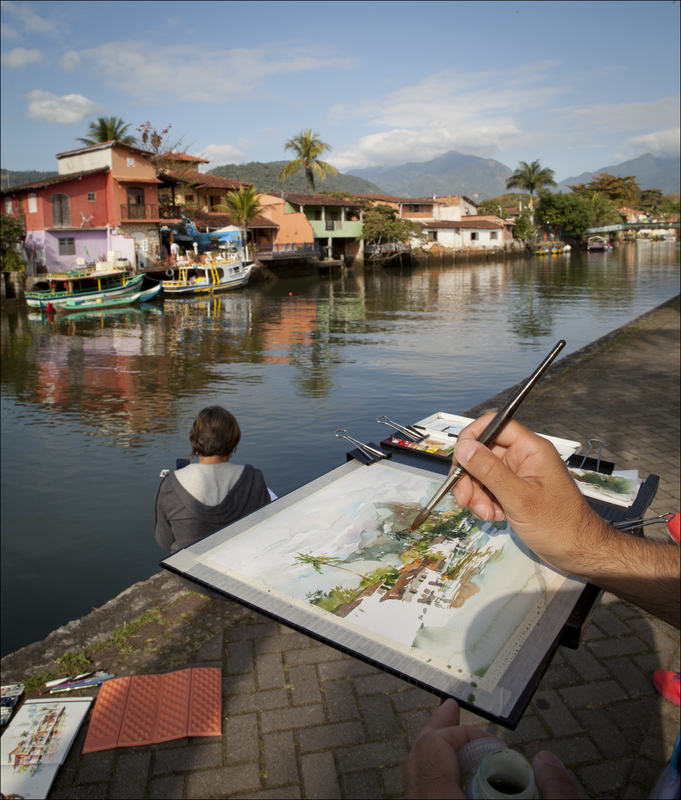 One of the fun stories from Paraty. Local people passing by on the way to work would naturally ask what was going on. This day we could say we had sketchers on the bridge from India, Scotland, Iran, Sweden, Australia, the USA, the UK, and Canada – painting together, learning from each other and having fun. 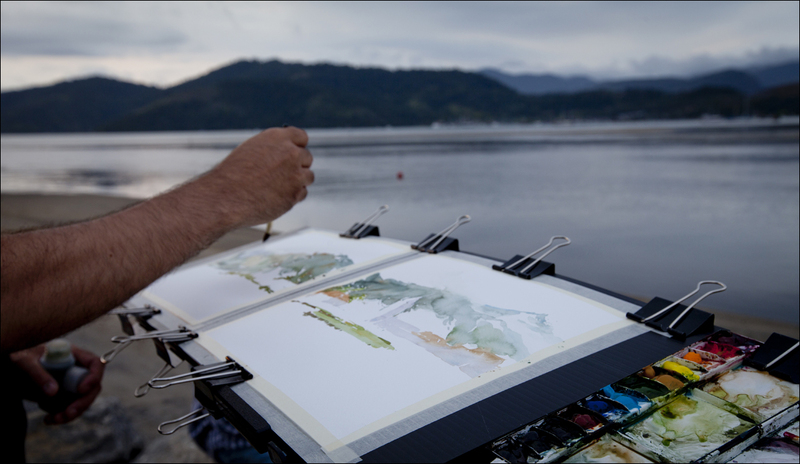 Sketching out in the world, you are always seeing something unexpected. The streets flooding with sea water at high tide was fairly unexpected. 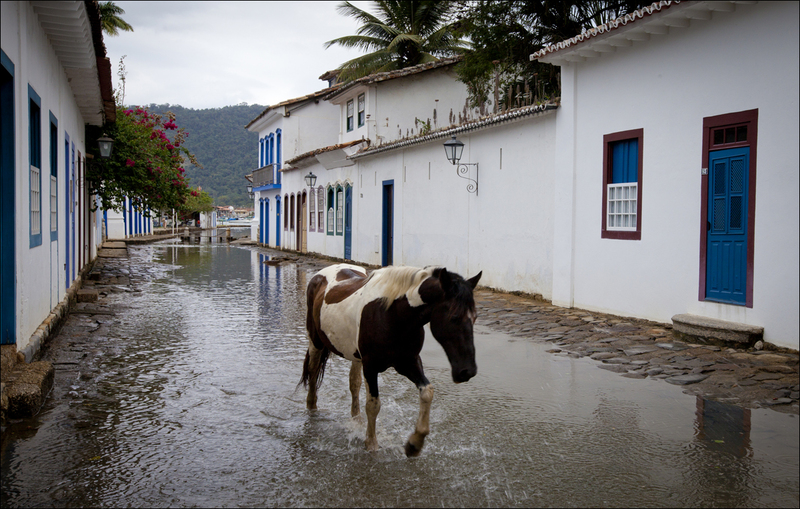 But so was this horse strolling through the flood. What happened next was less unexpected. What would be the worst thing a horse could do while splashing by you in a muddy street? Yes, that happened. 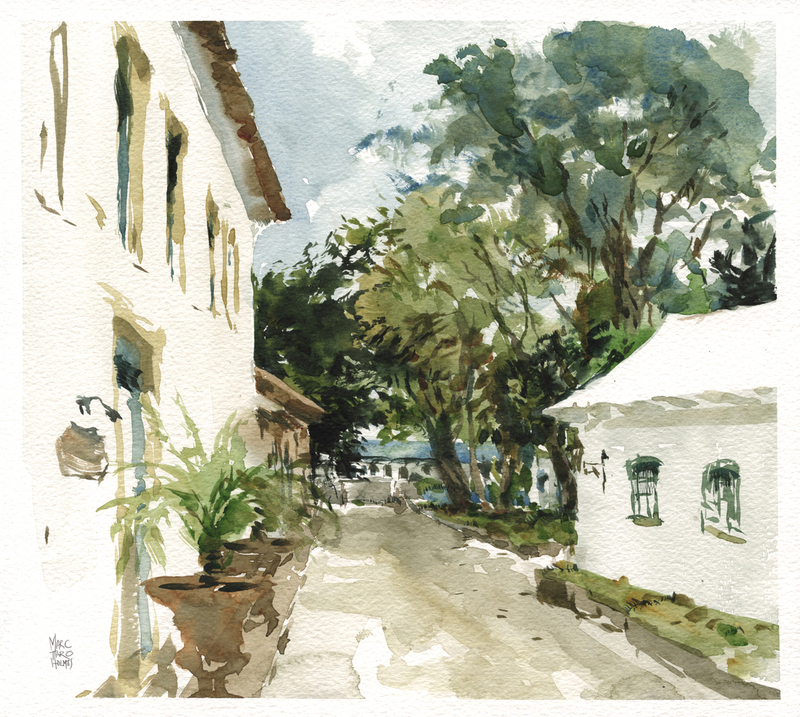 This is my first sketch done in Paraty, in the courtyard of our hotel. I think regular readers of my blog will see what I mean by the phrase Silhouette and Subdivide. It’s all encapsulated in this image here. 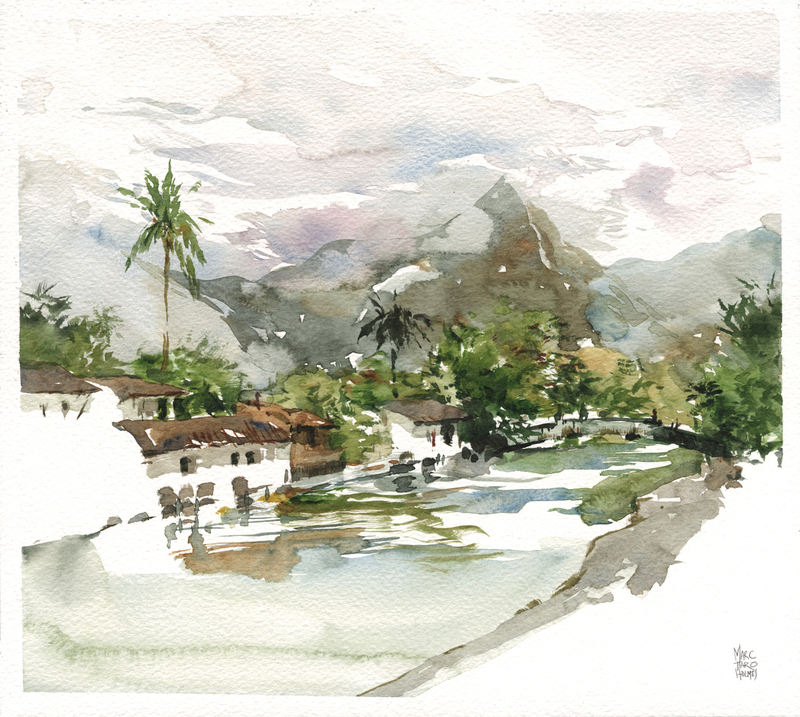 (For the history of this thought process, go back to my Direct to Watercolor series of posts). 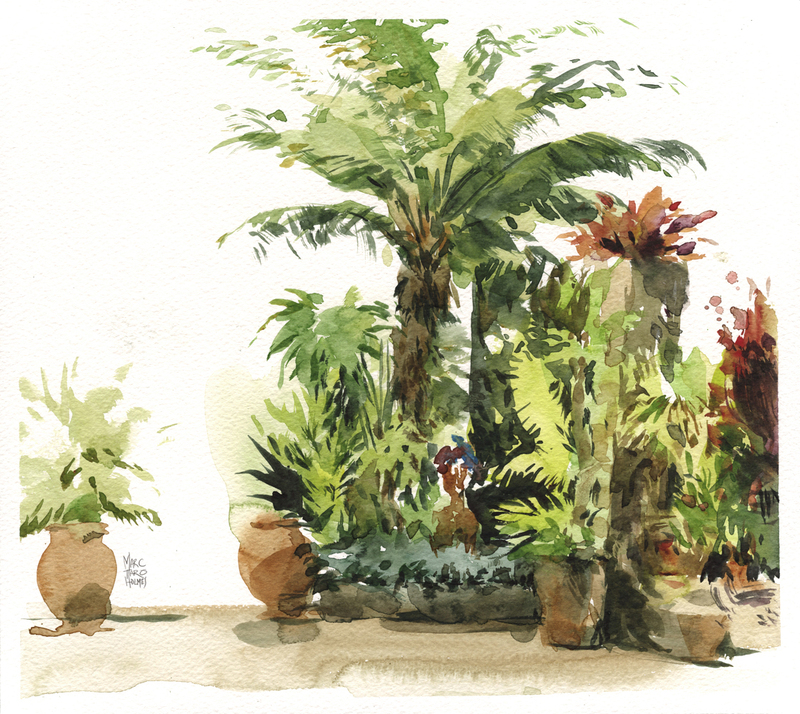 The common strategy behind all of these rapid sketches is to look for the largest silhouette shapes in front of you – such as the broad leaf palms or the egg shapes of the clay pots. Place them down in a single brush stroke. Once you have the composition (it only takes moments to make a few big shapes), you can then look at each shape and see how it can be subdivided with the darker tones of shadows. This is the logical followup to the ‘colored sketching’ exercise Tea, Milk and Honey that I teach beginners. After you TMH over a few dozen (well, maybe more) sketches, you’ll find you don’t really need the drawing any longer (if you don’t want). My how-to book on Urban Sketching goes back further, to the very beginning of this learning curve, starting with how to see silhouettes and shadows when drawing. I love that first reflections sketch. I’m especially fascinated by the things you chose not to draw in order to highlight the reflections. Love all of these. Great post. Heard about the symposium too late for this year. 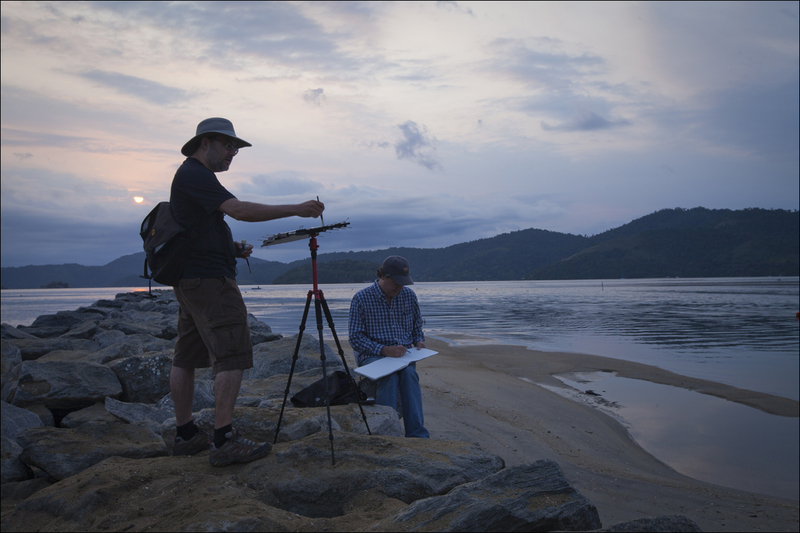 Your tripod looks very handy. I’ll be in Montreal for a week end of october to visit my daughter who is studying there. I’m from France. Could you tell me where I could buy your book there ? Unfortunately I don’t know exactly when the book hits the stores (the author is the last to know)! But what we could do, if your daughter is here in my home town, I can drop off (or regular mail) a copy as soon as I get my own order – if you want to pre-purchase it through me? Just let me know. This has the benefit that she’ll get a signed copy and a collectible print – but the downside I can’t say exactly when it will arrive. ALSO – if she is in Montreal, and likes art, I hope she will come out to our (free) drawing club – have her look at http://urbansketchersmontreal.wordpress.com/. We meet to draw together every fourth Sunday here in Montreal. Good idea. I ask her if it’s possible and I order the book through you. The 4th sunday of october will the day when we arrive in Montreal, too bad for me ! These sketches are wonderful. What a nice collection you’ve compiled. Do you keep your symposium sketches as a separate group, bound later into sketchbooks or do you mat them for sale? I’d love to take a class/workshop from you. I have to ask: what is the green/gray mix used for plants at the base of the palm tree? I need that color for some desert plants, but try as I might, I’ve not come up with anything close. 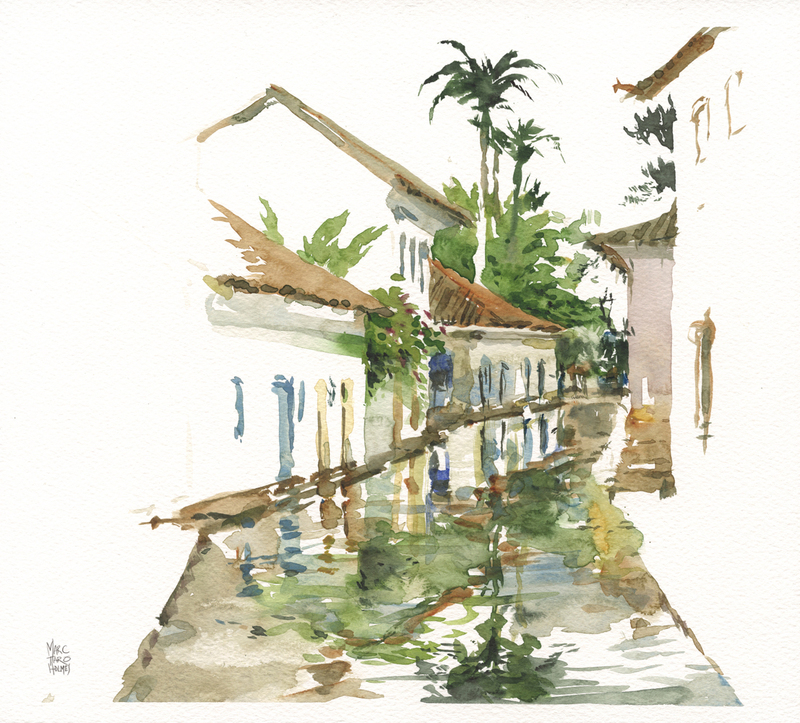 This year I brought sketchbooks for the ‘travel’ phase, but painted on cut sheets of watercolor for the workshop. So these are loose ones (and that does mean I do hope to sell some of them in fact :) Let me know if you’re interested!). That green/grey mix is perylene green. It’s available as shadow green from Holbein or under its chemical name perylene from Daniel Smith. It’s my new favorite color – it’s really great for all kinds of foliage. You could get something similar with any green mix and prussian blue, so it’s just a convenience color. But I like it as it’s powerfully dark. Sort of paynes grey, for green. Thanks, Marc for the info about that gray/green! So good to know it’s available in the tube. I rather fancy Daniel Smith paints, not that I have a huge supply, but do love the ones I have collected. Beautiful work. Your sketches makes me want to visit. 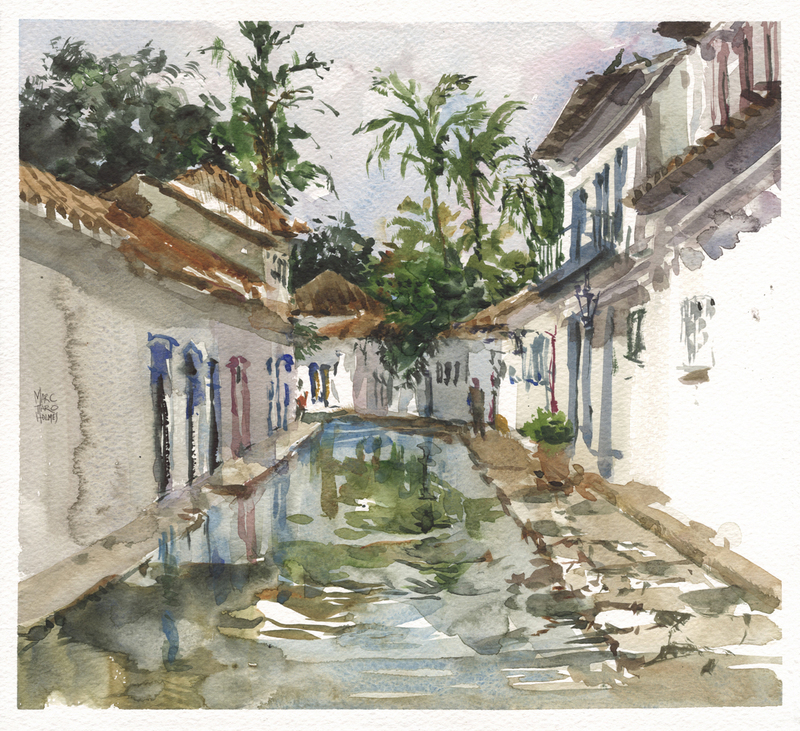 I really want to start some Urban Sketching. Is there a reason why you are not offering a digital version (EPUB/Kindle) version of your book? Hey Tiffany – well, all I can say is that in this case it’s entirely up to the publisher. I would love an e-version (I use ebooks extensively, and it’s better for the environment) – but I don’t get a say in that this time around. It might even be happening, but I wouldn’t know until it gets announced through channels. Perhaps I’ll have more pull after this book is a big hit! :) If you want, I can do a pre-order for you and send you a signed paper copy straight from my own desk? (With a bonus art print). Let me know if you like! Yes! I would like. An ebook would have been nice but it’s not the end of the world. So do I order through Amazon or send an email (Paypal)? Beautiful sketches Marc.I ordered your book ages ago so looking forward to having it in my hands.